Come join me this Saturday, Nov 20th, for a fun afternoon as I join Milwaukee troubadour, Jim Hoehn @ the Grace Inn! Adhering to his motto -- "Six strings, five fingers, three chords, no problem" -- Hoehn pumps out witty tunes tinged with sunny island themes and shady characters in dark scenarios. There is enough of a Jimmy Buffett flavor to his original music and compilations like "Thongs in the Key of Life," that Hoehn gets booked to play yacht clubs and Parrothead parties from Kenosha to Key West. Well, my summer job working for Jimmy Buffett is now a thing of the past, but what a way to close it out! It was the best show ever thanks to all of you who came out and rocked the house! 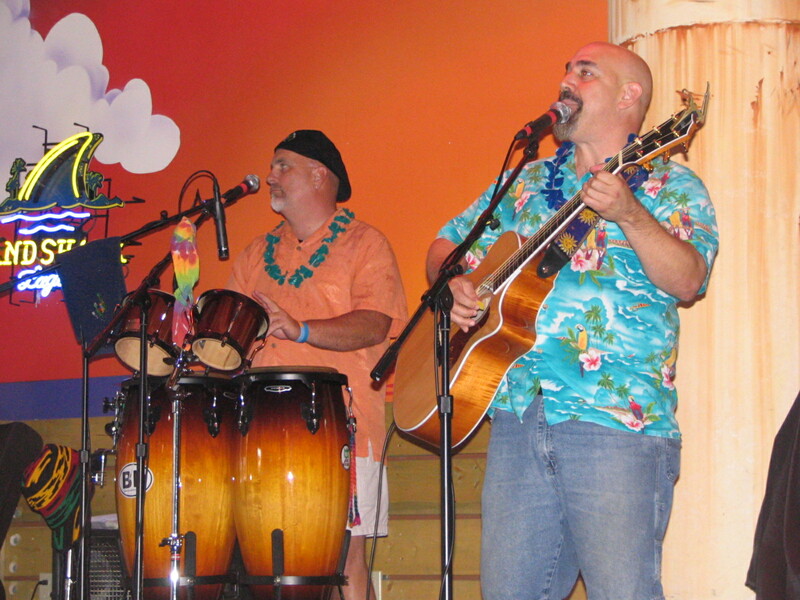 It was fun having Crime Dog back keeping the beat going on the congas, bongos, shaker, vibra-slap and backup vocals. Also a shout-out to the stealth tambourinist "Cheeseburger Don", former bassist from the 70's band out of LA, Imagery, for rocking it from the floor! Thanks again to my protege Keith Grigg for keeping the tunes going while I was on break. And how about that Bubbles! They don't call him Bubbles for nothing!. Actually, why do they call him Bubbles? I'll save that story for another time when I can come up with a better one than the truth. You'll be seeing him again real soon! I guarantee it! Thanks to everyone who come out time and time again and hoot and holler, and sing along with me. It's YOU that make this fun! Club Agave, AZ Parrotheads, 2010 Census Friends, Aliceheads, Old AF buds, and everyone else Thank you. You're the best! Stranded On A Sandbar Special Guest Appearance? Just in, another Margaritaville show has been added to my summer schedule for August 26th. Possible guest appearance from Arizona's premier ukulele extraordinaire, Bubbles Brooksby. He rarely makes public appearances, so this may be a once in a lifetime opportunity. You don't want to miss this! This will also be the grand finale for the Stranded On a Sandbar summer party series. Great food, awesome prizes and good times! Hopefully we can line up some more guests and really end this summer with a bang! I hope to see you all there. Margaritaville, Thursday August 12th from 5:00 - 8:00!